Application of ANSYS Software for Thermal Analysis of Permafrost Ground. Advantages of Frost 3D Universal Software. An engineering company has recently asked Simmakers to comment on the possibility of applying the finite-element package of ANSYS to the problems of ground thawing and thermal stabilization, and to explain the advantages of Frost 3D Universal software when solving such problems. Note that this issue has also been addressed by various specialists in dedicated forums and conferences. ANSYS with finite-element method analysis is used for ground thawing analysis. ANSYS is a longstanding universal software system for finite-element analysis. It is popular with specialists in the field of computer engineering (CAE, Computer-Aided Engineering) and finite-element solutions for linear and non-linear, stationary and non-stationary spatial problems of rigid body mechanics and construction mechanics (including non-stationary geometrically and physically non-linear problems of contact interaction of construction elements), problems of liquid and gas mechanics, heat exchange and heat transfer, electrodynamics, acoustics, and also mechanics of coupled fields. Below are the main reasons why it is difficult to use ANSYS and other universal finite-element analysis software systems for ground freezing and thawing problems, as well as why their use doesn’t add any practical value to design activities. 1. The ANSYS software package solution for heat exchange and heat transfer problems like ground freezing and thawing is based on the implicit formulation of finite-element methods. 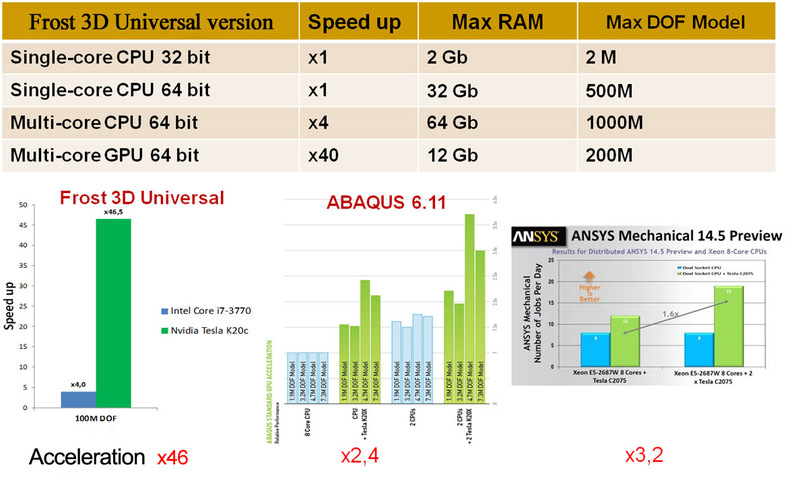 ANSYS therefore resorts to the Newton-Raphsons and other iteration methods (successive approximations method, etc.). However, the problem of ground freezing and thawing is related to highly non-linear problems due to the dramatic change of thermophysical properties of ground as well as heat emission/absorption as a result of “water-ice” phase transitions occurring in ground. When applying the methods ANSYS employs (implicit formulation of the finite-element method and application of the Newton-Raphsons method for linearization) for solving such problems, there is a problem of convergence of the numerical method (with every subsequent iteration of the numerical solution, the new result deviates further and further from the true solution to the problem). This is due to the fact that Newton-Raphsons iterations only converge if the initial chosen estimate was very close to the true solution. For example, in case of the problem of ground freezing and thawing, the effective heat capacity of the ground changes dramatically with temperature. As a result, an insignificant temperature change leads to a very large change in heat capacity, which is why the initial estimate in the Newton-Raphsons method taken from the previous time step (the same procedure used in ANSYS) leads to the non-convergence of the method. Thus, when solving most of the practical problems regarding ground freezing and thawing, the numerical method in ANSYS returns low accuracy and, using this software, the solution is sometimes unobtainable. 2. When solving problems of ground freezing and thawing, the initial data required for the calculation are the following thermo-physical properties of the ground: heat capacity and thermal conductivity for unfrozen and frozen ground, dependence of unfrozen water content on ground temperature, phase transition onset temperature in the ground. In the ANSYS package, however, in order to solve thermal problems, we need to specify the change in heat capacity and thermal conductivity with temperature. Thus, in order to solve for ground freezing and thawing in the ANSYS package, the user has to write a dedicated software routine, which, on the basis of thermo-physical properties of ground (for the three parameters listed above), will calculate the dependence of heat capacity and thermal conductivity on temperature. 3. When considering the problems of ground freezing and thawing, it is often necessary to take the presence of ground thermal stabilization devices (thermosyphons) into account in the computational domain. This is impossible to calculate in ANSYS as it cannot solve the equations describing the operation of thermosyphons. 4. When solving ground freezing and thawing problems, there is often a complex engineering-geological structure of the ground. 3D geometry of the engineering-geotechnical ground structure is reconstructed in the process of solving ground freezing and thawing problems by interpolating the data on the ground structure obtained from engineering-geological boreholes. The ANSYS package lacks any such tools for creating complex geometries of engineering-geological ground structure. Advantages of Frost 3D Universal. 1. The Frost 3D Universal software package was specifically designed to solve ground freezing and thawing problems, taking into account thermal effect of various constructions (pipelines, boreholes, etc.) and thermosyphons, so it does not suffer any of the above-mentioned problems. In Frost 3D Universal software, there is no convergence problem with calculations involving phase transfer and it is possible to factor in the operational activity of thermosyphons; user interface is focused on ground freezing and thawing scenarios and the software contains all the necessary tools to manage these tasks. 2. When solving ground freezing and thawing problems, it is often necessary to simulate thermal processes across large spatial dimensions (hundreds of meters), which include elements of very significant geometric dimensions, prior to take into account (thermal insulation materials, pipes of boreholes, oil and gas pipelines, thermosyphons). This leads to the creation of a computational mesh in the order of 10 million nodes. 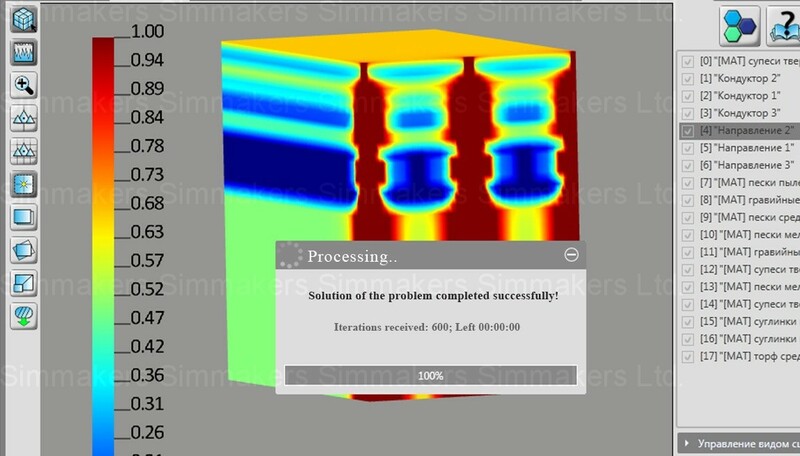 Simulation of thermal processes on meshes of 10 million nodes in ANSYS software and other finite-element analysis software is very difficult to perform due to the long computational time (several days), and such problems are impossible to compute on a personal PC due to the lack of RAM. The Frost 3D Universal software has mathematical solvers, parallelized on GPU, enabling the calculation of heat problems on multimillion meshes several times faster than any other FEA software, including ANSYS. This entry was posted in Frost 3D Universal. Bookmark the permalink.